Happy Tuesday everyone! What great news do I have to share with you today?! Well besides the awesome turn out that we had at the AMOC and Amaretto horse race? Well its that time again and the year seems to be flying by! As this month and events end it brings a new list of events and things Amaretto will be doing this month! 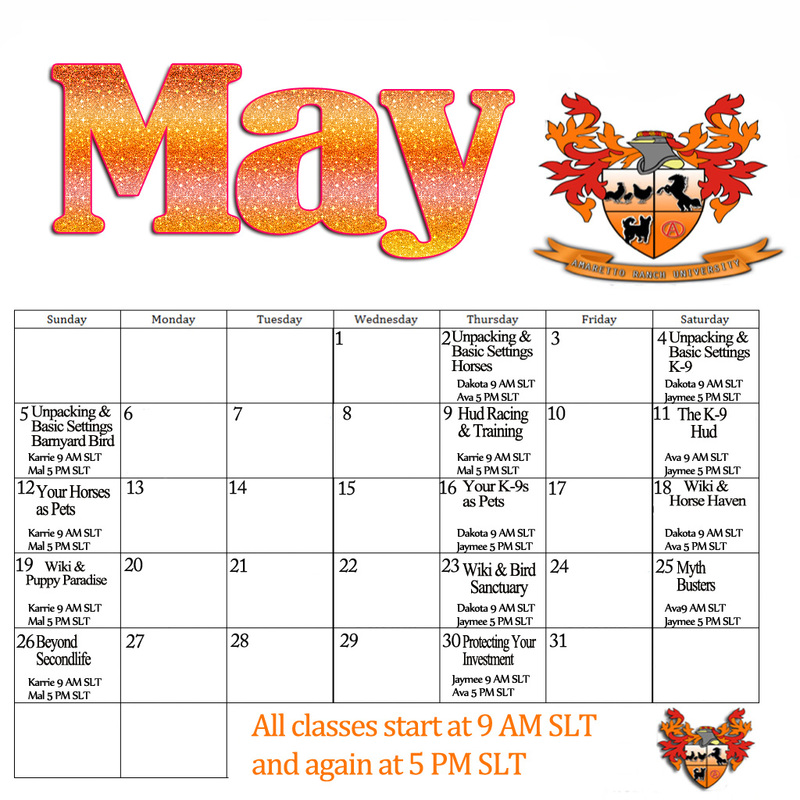 So here is the first look at the May calendar! We have all kinds of fun things planned for the community to come out and together to enjoy! Barrel racing, fishing event, and club Amaretto! There will not be a Dakota show in the month of May, they will resume in June! So take your first look at these events and the ARU classes and I hope to see you there!!! Well until next time Happy Breeding everyone this is Ava over and out! Heres a sneak peek about a new event coming in May!!! On May 9th at 3:00 pm (slt), at the Boomtown Race track, Amaretto will host its first Barrel Racing Event. This new racing event promises lots of fun and excitement, and a great challenge for the people entered in the races. Each race is only 1 lap, and we will be doing races in all divisions. So send in your entry note cards labeled Barrel Race, include in your card your SL name and Division Class please. All entries must be received by midnight May 7th, make those note cards and send them to Avalon Crystal or maleficent Farshore right away. This is a new event and you certainly do not want to miss out on this one. They say Laughter is this best medicine around, and I feel sure that this event will produce lots of it! ALSO, remember tomorrow is the A.M.O.C and Amaretto joint sponsored race at Boomtown at 3:00 pm (slt). Even if you are not entered, come on out and cheer for your favorite horse! I look forward to seeing everyone at the RACES!!!!! While “clowning” around in the office I realized that it was the 28th and time to announce the Showhorse and Best in Show K9 for May. So next up in the “Big Top” are……..the Amaretto Showcase Perlino & the Best in Show Dane!! Beginning May 5, 2013 to June 4, 2013 any bundle dropped from the breeding of any 2 Perlino horses has the chance at being an Amaretto Showcase Perlino. Beginning May 5, 2013 to June 4, 2013 any kennel dropped from the breeding of any 2 Great Dane K-9s has the chance at being a Best in Show Dane. So get those Danes and Perlinos ready so they will be breeding age by the 5th! Happy Breeding everyone!! I wanted to remind everyone what a great resource the Amaretto University is for breeders. As a professor at the University I can tell you that the classes are informative and fun to attend. You can ask the Amaretto Staff questions afterwards about the class and get answers right from us and not rely on that nasty rumor mill! Once you start attending classes you will want to be able to keep up with which ones you’ve attended and which ones you still need. That means you will want to register on the ARU website so you can do that. While at the University there are kiosk’s in the back of the classrooms that you touch and they give you a username and password in local chat. Once you have that you can go to the Amaretto Ranch University website and log in! . Happy Happy Thursday everyone! Today has been a wonderful day! This morning we had a amazing Spring Fling event lead by Karrie and Ava. We talked and danced as we listened to awesome tunes spun by Miss Dakota. What fun it was!! 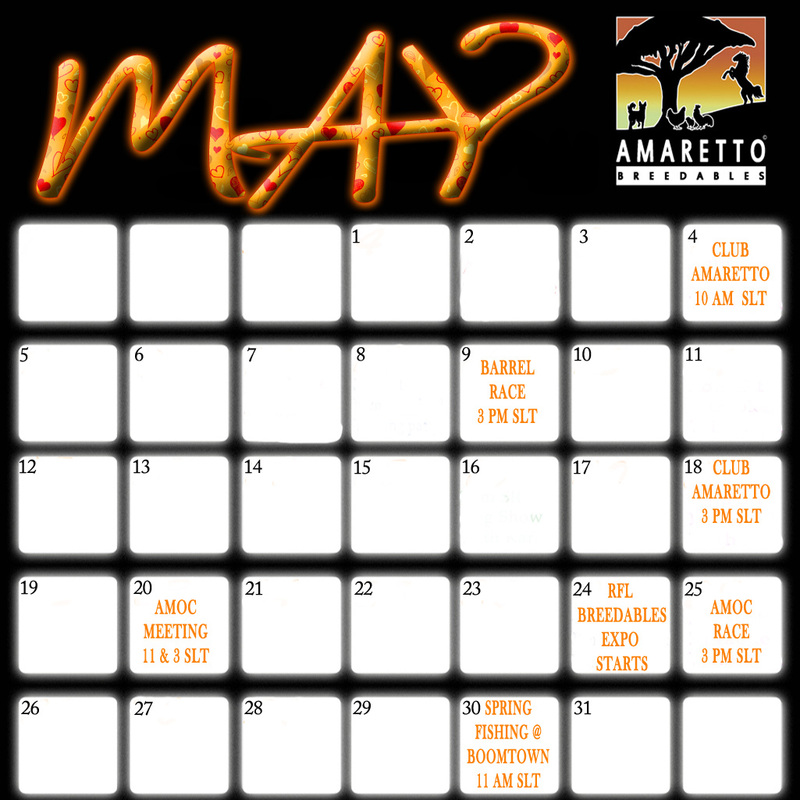 Be sure to check out our calendar for more exciting upcoming Amaretto events! As for my Customer Connection, I want to take a moment to go over one of our amazing and handy tools that I feel is a must have when raising and breeding Amaretto breedables. This nifty tool is called the GPS. I am going to answer a few common questions about the GPS and go over the basics of this tool as it is pretty much the same for all 3 breedables, Horses, K9, or birds. What does GPS stand for and where can you get one? GPS stands for Global Pony Settings and you can pick one up at any of the Amaretto Ranch Breedables Horse store locations. GPS. stands for Global Pup Settings and you can get one at all of our Amaretto Ranch Breedables K9 store locations. GPS. stands for Global Peck’n Sort and this can be found at all Amaretto Ranch Breedables Barnyard Bird store locations. I picked up a GPS … now what do I do? How do I use it? First you want to start by opening the box to your inventory. Locate the GPS in your inventory and rez to the ground in world. Once you have set all settings to your wants and needs you simply click the Activate button and you settings will then take place! When I click Activate on the GPS will it work on all my breedables on my sim? The answer is Yes! The GPS will apply the settings you choose to all rezzed Horses, K9s, or Barnyard Birds on your sim. The GPS works sim wide. If you have horses, k9s, and birds you must use the breed specific GPS to set their settings. There is not a universal GPS that works on all three breedables. Also, I’d like to mention, if you have special projects that have special settings, please remember this when using the GPS as it does apply the settings to ALL rezzed horses, k9s, and birds. I hope everyone now understands the GPS and how it works. It is a very hand tool, especially for when a herd of 10 breedables becomes and sim wide farm of 100s! Happy breeding and GPS setting to everyone!! Puppy Paradise is a great place to pick up some of those much needed consumables for your K-9s or a gorgeous Dalmatian to add to your pack! You can always go to the Haven sim and check your Kennel Cash balance so you know what you have to spend!! How to Gain Points By Sending Your K-9 to Puppy Paradise: Simply click your K-9, click settings, click Puppy Paradise, then click yes. The number of Kennel Cash you received from the K-9 is posted in local chat. Kennels may be sent to Puppy Paradise without birthing. Hey guys its a terrific Tuesday! Whats new at Amaretto? Well ill tell you! I wanted to give you all a peek at the brand new K-9 zodiac eye! 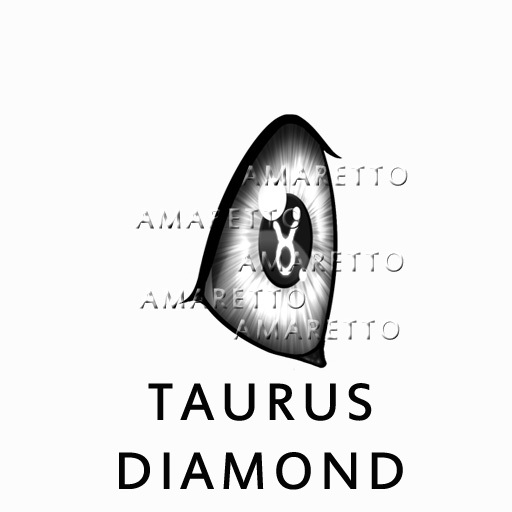 Presenting the Taurus Diamond eye! You know they say diamonds are a girls best friend! So now you are wondering how do i get my hands on that one? Well I will tell you, You can have a chance at one of these exciting Non-Starter eyes as they are randomly dropped into kennels at the time the kennel drops. Your k9 needs to be version 1.5 and higher for this eye to drop. So keep a eye out for this new eye! Until next guys Happy Breeding! Don’t forget to come visit me at a questions and answer that I have almost daily! This is ava over and out! Let’s Go To The Races!!!!! You don’t want to be late for the start/finish line! Amaretto and A.M.O.C are having a joint Horse Race. This event will start at 3:00 PM slt, on Tuesday April 30th, and will be loads of fun for all. Even if you don’t want to be in the races you can still come watch from the Grandstands! The races will be held at the Boomtown Race Track. Get those entries in by Monday and Let’s go to the Races !!!! Happy Friday Everyone! Hope you have all had a wonderful week! I wanted to take a moment to remind everyone about the Amaretto Forums. The forums are located on the Amaretto Website and have sections set up to talk about each one of the animals, Birds, K-9s and Horses. There are sections to ask questions, to chat, and to advertise. There is a section dedicated specifically to the AMOC group, there is a place to share inspirational messages with your community and even share what breedables means to you. The Amaretto Forums are a valuable resource that is always available to use. If you haven’t explored the forums or the rest of the Amaretto website then you should make time to do that today! “Last Bundle” and “Last Bred” Buttons… What Are They?